Cushion covers made to fit any size cushion or mat. Foam not included. We need the size of the foam block in inches [ length x width x thickness ] Our zip on covers are made using top quality fire retardent upholstery material. 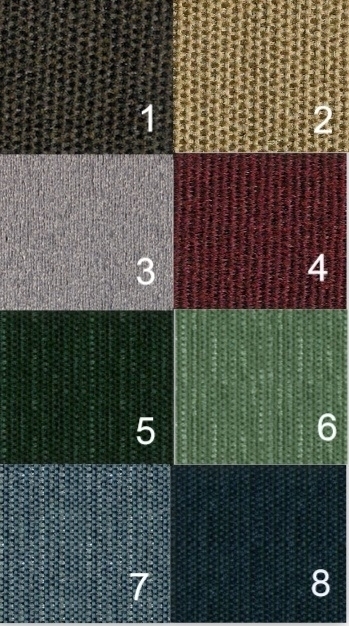 Eight colors, Brown 1, Tan 2, Grey 3, Burgundy 4, Dark Green 5, Light Green 6. Light Blue 7, Dark Blue 8. Vinyl under side material. Grey, Off White, Brown. Large Color Chart Curtains and valances for your pop up camper. Feel free to send questions on your project. Spring sale prices. Order early. Let us know if plywood is zipped inside; $9 extra fee per cushion. Any measurements larger than listed will be $5 per cover more. 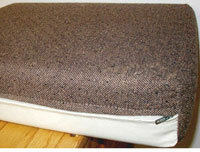 To order Email or call Sherry, 715 255 9262 For pricing on other size & shape covers we need your quantity and sizes.